Most school buildings and classrooms were built before the onslaught of modern, computerized education technology. Nowadays, educators and administrators are working on redesigning their classrooms to accommodate the physical role that technology now plays in the classroom. 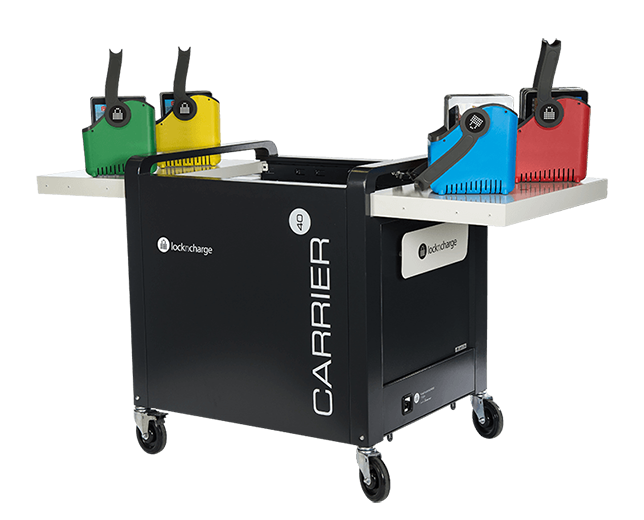 Administrators have been turning to mobile device carts to easily store, charge and distribute mobile devices to help with this issue. On the flip side, teachers have finding new ways to incorporate mobile carts into the often cramped classroom configuration. Charri Stratton, director of instructional technology for Putnam City Schools in Oklahoma City, OK, has plenty of experience with mobile carts and their incorporation into classrooms. Her school district is nearly 1-to-1, with about 19,000 students and 15,000 iPads. All five of the middle schools in her district are going 1-to-1 next year. Stratton oversaw the deployment of the 15,000 iPads and about 375 mobile carts, and has witnessed teachers using the carts in creative ways. THE Journal: What kind of mobile device carts do you use in your district? Charri Stratton: They’re all LocknCharge. They did give us a pretty good deal. The initial deployment was a pretty large deployment. There are a couple of different models. Each one holds about 40 [devices]. The carts keep them safe and can charge the iPads in them. THE Journal: What are some of the creative ways teachers have used mobile carts other than storage and charging? Stratton: They’ve used them to mount projectors. Teachers have used them as a teaching station, a place to put all of their teaching materials. There’s one teacher who uses his as his desk. He walks around a lot, and uses the top of his cart for his stuff. Students have used them and set up science experiments on top of it. It’s used as a reading station — a little library area on top of the cart. Students are drawing on top of the cart, writing on top of the cart, using it as another piece of the classroom. THE Journal: How long have you been using the carts? Stratton: We’re into our fourth year with them. They’re distributed among our 28 schools. Carts do not go from school to school. THE Journal: Has using the mobile devices changed the dynamic of teaching and learning in the classroom? Stratton: Yes, definitely. Before this technology age that we’re in, teachers had to tell the information, because they’re the only ones who had it. Now the learning has shifted to the students. There’s very little lecture. Kids are really digging deep into their subject. It’s definitely more student-centered. If kids can Google answers, you’re asking the wrong questions. THE Journal: Chromebooks seem to be very popular in K–12 education these days. Did you consider Chromebooks rather than iPads? Stratton: We looked at Chromebooks and we’ve gone back. We’re pretty happy with the iPads and we’re sticking with them. I will say we’re getting 2,000 new [iPads] soon. The ones that we’re selling back have pretty good re-sale value for us. And actually our students are very comfortable typing on the iPad. We’re making it work for the students. Anything we can do to make it work that makes sense, we do.